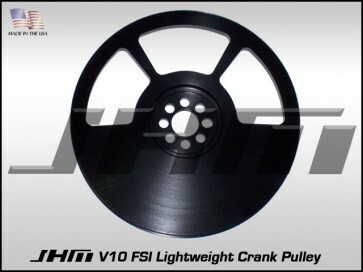 Introducing the JHM V10 FSI Lightweight Crank Pulley for the C6-S6 and D3-S8 with the V10 FSI. 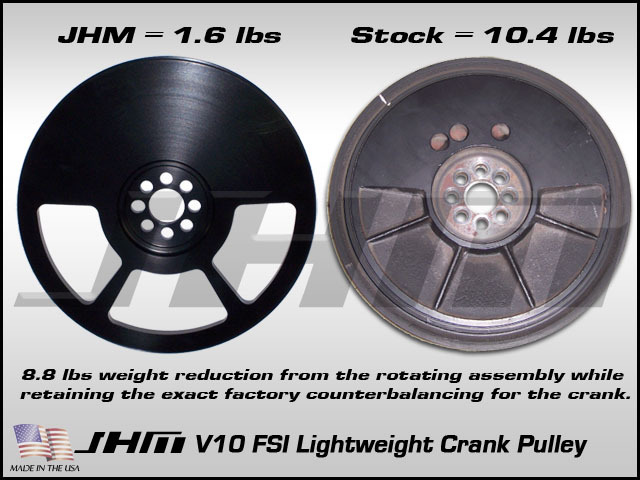 These JHM Lightweight Crank Pulleys are perfectly counterbalanced just like stock for proper engine balancing while dropping nearly 9 lbs of rotating mass in the process!!! We also have the pulleys anodized in black so they more closely resemble the stock pulley and blend in better. Reducing the rotating mass of parts in or attached to the engine frees up horsepower. This modification is not a drastic horsepower increase but it is a key piece of the puzzle in unlocking the power of your naturally aspirated V10 FSI. - When doing this modification it is a great time to replace your drive or alternator belt. We sell these in this section of our store. - It is important that you notice how tight your stock belt is prior to removal to gain access to the pulley. If you do not tighten it at least as tight as the stock belt was it will slip and squeal. - One bolt hole in the OEM crank pulley has a dowel in it and must be removed and inserted into the JHM pulley. Then it can only go on one way. - Torque all bolts to 20 ft lbs in a star pattern. We also recommend using loctite.